Indexable carbide insert cutting tools for gears are nothing new. But big gears have recently become a very big business. The result is that there's been a renewed interest in carbide insert cutting tools. Natural resources—minerals, coal, oil, agricultural products, etc.—are the blessings that Mother Earth confers upon the nations of the world. But it takes unnaturally large gears to extract them. Quality, materials and technology continue to challenge the big gear manufacturing market. 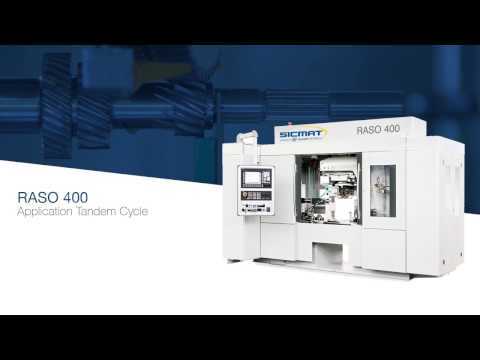 When a customer needed gears delivered in three weeks, here’s how Brevini Wind got it done. In spite of being the "Second City," Chicago has always cultivated a reputation for bigness. We're known for big talk, big shoulders, big basketball players - and big gears. While not necessarily the biggest in the world (more about that late), some Chicago gears are among the hardest working. An overview of nondestructive testing and its importance in the manufacture of big gears. It's not easy being big. Maybe that's not exactly how the phrase goes, but it's applicable, particularly when discussing the quality requirements of large gears. The size alone promises unique engineering challenges. BONUS Online Exclusive: Big or Small - Inspection is Key to Success. Much of the existing guidelines for making large, high-performance gears for wind turbine gearboxes exhibit a need for improvement. Consider: the large grinding stock used to compensate for heat treatment distortion can significantly reduce manufacturing productivity; and, materials and manufacturing processes are two other promising avenues to improvement. The work presented here investigates quenchable alloy steels that, combined with specifically developed Case-hardening and heat treatment processes, exhibits reduced distortion and, in turn, requires a smaller grinding stock. Readers respond to our "Job Shop Lean" column and the "My Gear is Bigger than Your Gear" article. Faith — paraphrasing the gospels of Matthew and Mark — can move mountains. But it helps if you have precision geared equipment. Readers respond regarding the article from March/April 2013. Methods of examining large ring gear teeth to detect surface breaking discontinuities have often been time-consuming and limited in terms of data collected. Methods such as visual and magnetic particle inspection can miss critical discontinuities. However, a new ASTM international standard provides a more effective method for gear examination using eddy current array, a technology that has been widely used but, until now, not standardized. Video from C&B Machinery; Introducing the Gear Technology Blog, featuring technical editor Charles D. Schultz; plus an online-exclusive article on big gear inspection. At first sight the appearance of 5-axis milling for bevel gears opens new possibilities in flank form design. Since in comparison to existing machining methods applying cutter heads no kinematic restrictions exist for 5-axis milling technology, any flank form can be machined. Nevertheless the basic requirements for bevel gears did not change. Specifications and functional requirements like load carrying capacity and running behavior are still increasing demands for design and manufacturing. This paper describes the demands for gear design and gives an overview about different design principles in the context of the surrounding periphery of the gear set. For this year’s exercise in large gears, we’re not going to dwell on size range or length, merely look at the fundamental challenges and latest technologies required to manufacture large parts in the gear industry. This could be a gearbox assembly for the construction, mining or oil and gas industries or simply a large standalone gear pinion set for a custom application. Whatever the industry or application, large gears require more preparation, planning and precision than other areas of gear manufacturing. Large bevel gears drive the crushing machines used to process ores and minerals in the hard-rock mining and aggregates industries. This paper is intended to help the reader understand the unique aspects of these machines, and why crushing applications fall outside the traditional automotive paradigm for bevel gears. New turnkey, "off-the-shelf" Gleason 2700AR system automates larger-gear load/unload to speed throughput, optimize process flow - and take the weight off the operator. Business is finally starting to get back to usual in the big gear world, which offers us a chance to look back at the greatest lesson on how to survive an economic downturn. Includes the sidebar: "Brass Tacks with Klingelnberg." Large, multi-segmented girth gears do not behave like the relatively compact, rigid, monolithic structures we typically envision when discussing gear manufacturing. Girth gears are very large, non-rigid structures that require special care during the machining of individual mating segments as well as the assembled gear blank itself. This paper presents two new techniques for aligning and maintaining large ring gears. One technique uses lubricant temperature analysis, and the other uses stop action photography. Multiple possibilities are available to increase the transmissible power of girth gears. These solutions include: using a larger module, increasing of the gear diameter through the number of teeth, enlarging the face width, and increasing the hardness of the base material. The first three parameters are mostly limited by cutting machine capability. Module, outside diameter, and face width (for a cast gear) can theoretically be increased to infinity, but not the cutting machine dimensions. There are also practical limits with respect to the installation of very large diameter/large face width gears. This paper presents a new approach to repair industrial gears by showing a case study where pressure angle modification is also considered, differently from the past repairing procedures that dealt only with the modification of the profile shift coefficient. A computer program has been developed to automatically determine the repair alternatives under two goals: minimize the stock removal or maximize gear tooth strength. Let's talk about large gears. Not the size or scope or inspection process, but the forecast and market potential in areas that utilize these massive components. We'll examine key industry segments like energy and mining and tap IHS Economics for a forecast for 2016 and 2017 (spoiler alert: it's not great). Additionally, we'll discuss some of the critical factors influencing global big gear manufacturers Ferry-Capitain and Hofmann Engineering. In this article, the authors calculated the numerical coordinates on the tooth surfaces of spiral bevel gears and then modeled the tooth profiles using a 3-D CAD system. They then manufactured the large-sized spiral bevel gears based on a CAM process using multi-axis control and multi-tasking machine tooling. The real tooth surfaces were measured using a coordinate measuring machine and the tooth flank form errors were detected using the measured coordinates. Moreover, the gears were meshed with each other and the tooth contact patterns were investigated. As a result, the validity of this manufacturing method was confirmed. The large gears found in mining, steel, construction, off-road, marine and energy applications—massive and robust in nature—need to tackle the greatest production demands. This, in turn, means that a special emphasis must be put on the heat treating methods used to increase the wear resistance and strength properties of gears this size. Meeting the many challenges of large gear inspection. Most research on micropitting is done on small-sized gears. This article examines whether those results are also applicable to larger gears. Big gears and wind turbines go together like bees and honey, peas and carrots, bread and butter and—well, you get the idea. Wind isn’t just big right now, it’s huge. The wind industry means tremendous things for the energy dependent world we live in and especially big things for gear manufacturers and other beleaguered American industries. The complete product news section from the January/February 2009 issue of Gear Technology, featuring giant-sized David Brown girth gears, gear inspection up to 4.5 meters and the latest Gleason gear grinder. Gary A. Bish, director of product design technology for Horsburgh & Scott, discusses his role as chairman of the AGMA mill gearing committee. In the wide, wide world of moving parts, the gears required for the big jobs—the really big jobs—often experience big problems. Proper lubrication of these gears is paramount in industrial applications such as wind turbines, kilns, sugar mills, crushers, heavy construction, offshore drilling rigs, mining and quarrying. Nondestructive examination (NDE) of ferrous and nonferrous materials has long proved an effective maintenance and anomaly characterization tool for many industries. Recent research has expanded its applicability to include the inspection of large, open gear drives. Difficulties inherent in other NDE methods make them time-consuming and labor-intensive. They also present the user with the environmental problem of the disposal of used oil. The eddy current method addresses these problems. This article discusses briefly some common manufacturing problems relating to coarse pitch gears and their suggested solutions. Most of the discussion will be limited to a low-quality production environment using universal machine tools. A road map is presented listing critical considerations and optimal use of materials and methods in the construction of large gears. In our unceasing attempt to further educate our readers - and find new and creative ways to waste time at work - the Addendum staff has spent many long hours (and many dollars on popcorn) to bring you our latest research on gears in film. The type of lubricant and the method of applying it to the tooth flanks of large open gears is very important from the point of view of lubrication technology and maintenance. When selecting the type of lubricant and the application method, it is important to check whether it is possible to feed the required lubricant quantity to the load-carrying tooth flanks, This is necessary to avoid deficient lubrication, damage to the gear and operational malfunctions. It is important to determine the type of lubricant, which may be fluid or grease-like. The consistency of the lubricant will have a direct impact on the ability of the lubrication system to feed adequately the lubricant to the gear. The interactions between the common types of lubricant and the lubrication application methods for open gear drives are shown in Fig. 1. The word gear, in various forms, has been in use since around A.D. 1200, according to the Oxford English Dictionary. Last issue we brought you Shakespearean gears. Now we'd like to show you some of the uses Americans have given our favorite word (from the Random House Dictionary of American Slang). Sivyer Steel Corporation, Bettendorf, IA, an ISO-9002-certified casting specialist, is familiar with tackling tough jobs. The company has built an international reputation as a supplier of high-integrity castings, especially those which require engineering and/or full machining. Its not unusual for Sivyer's customers, especially those in the mining, recycling, power generation, valve and nuclear fields, to ask the foundry to produce a one-of-a-kind casting - often something revolutionary - but AnClyde Engineered Products' request was a special challenge, even for Sivyer. More Gears in Cyberspace Dial in to the web site of Chicago's Museum of Science and Industry for an online version of the museum's Gears from the Century of Progress exhibit. Many years ago, when asked how the five-meter gear was checked, the quality manager responded, “When they’re that big, they’re never bad!” That may have been the attitude and practice in the past, but it no longer serves the manufacturer nor the customer. Requirements have been evolving steadily, requiring gears to perform better and last longer. Carburized gears have higher strengths and longer lives compared with induction-hardened or quench-tempered gears. But in big module gears, carburizing heat-treatment becomes time-consuming and expensive and sometimes cannot achieve good hardness due to the big mass-effect. 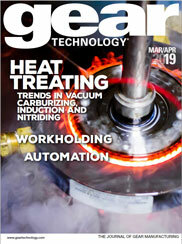 Also, it is not easy to reduce distortion of gears during heat treatment.